Hello, my name is Michele Welton. If you've been cruising around my website, reading my articles, you've probably picked up that I've been raising and training and writing about dogs for over 35 years. What frustrates me, more than anything else, is all the misinformation out there.... on the Internet.... in books and articles.... from family and friends.... about feeding and caring for your dog. Your dog's eyes say, "I love you, and I trust you to take good care of me." Their advice, though well-meaning, may be outdated misinformation. If you follow it, your dog will probably live a shorter – and unhealthier – life. Let's look at some of that misinformation, shall we? Let's start with a quiz. Dry kibble is good for your dog's teeth. You should feed your dog a premium-quality, dry or canned dog food. Rawhide bones, cornstarch bones, and pig's ears are safe chew toys that keep your dog's teeth clean. Your puppy needs a series of vaccinations.... that is, he needs to be vaccinated 3 or 4 times against distemper, parvovirus, coronavirus, leptospirosis, and kennel cough? Your adult dog needs booster shots every year? 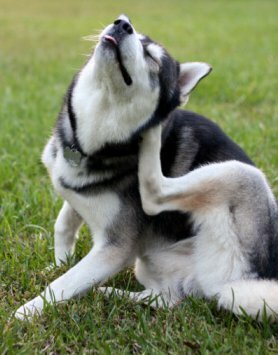 Your dog needs to be wormed regularly? Darn it, all of those are wrong, too. Use a choke collar for walking or training your dog. Spay or neuter your dog at six months old. Choose a vet based on how happy your dog is to see him. Don't worry, it's not your fault! When it comes to raising and caring for your dog, most of what you've read or been told to do is based on outdated MIS-information. The wrong food can cause chronic health problems all through your dog's life. Itching, hot spots, dry hair, oily hair, excessive shedding, ear infections, loose stools, gassiness that can clear a room.... you might never think to connect those health issues with feeding the wrong food. The wrong vaccinations can make your dog terribly sick and too many vaccinations can weaken his immune system, which leaves him more vulnerable to illness. The wrong flea products can be toxic – yes, even "natural" flea products. Neutering and spaying at the wrong age can result in bladder control issues (incontinence) later in life. The wrong chew toys can cause vomiting, diarrhea, choking, intestinal blockages, even death. 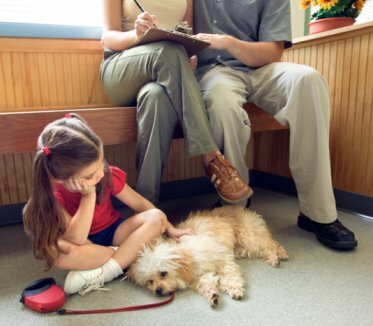 Taking your dog to the wrong vet means an unhappy lifetime of drugs, chemicals, and medications, with their high costs and all of their side effects. That's why I wrote this book.... to show you how to care for your dog so he lives a long, healthy life and seldom needs to visit the vet. There are 11 Things You Must Do Right To Keep Your Dog Healthy and Happy. Your dog is counting on you to do these 11 things! If your dog is a puppy.... I'll show you how to raise him in all the right ways, from the very beginning – so he doesn't develop health problems as he grows up. If your dog is healthy so far.... don't be fooled. He will almost certainly develop health problems if you're following any of that misinformation we talked about earlier. I'll show you how to make just a few changes in how you're caring for your dog that can make all the difference to his future health. And if your dog already has health problems.... take heart. Follow the health care program in my book and you'll greatly improve your dog's chances of beating those health problems, or at least living more comfortably with them. "Your health care book is setting me straight..."
"I discovered that I was making just as many mistakes with Sugar's health care as I was with her training. (Sugar is a Shih Tzu.) Your training book straightened us out so she became the most well behaved dog I could ever ask for. Now your health care book is setting me straight on a lot of things I was doing wrong." The worst foods for your dog. Sadly, many owners who have been trying to feed the best are actually feeding the worst. Which vaccinations your puppy or adult dog really needs. Vaccination guidelines have changed drastically..... but most vets aren't telling you that, because vaccinations make up a significant part of their income. 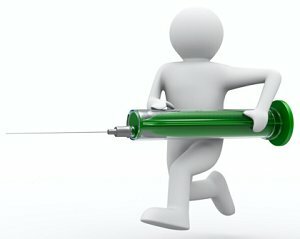 The wrong vaccinations.... or too many vaccinations.... can cause serious health problems. Don't get any more shots for your dog until you've read this chapter in my book. "Your book has really opened my eyes"
"Hi, I downloaded your book and just wanted to tell you how much I am enjoying it. It has taught me more about being a good caregiver when it comes to feeding my dogs. I always thought I was doing what was best for them, but your book has really opened my eyes and I appreciate that." What your dog's food and water dishes should (and shouldn't) be made of. "Nobody else writes the way you do, it's most enjoyable to read." "Your books have helped me raise and train my puppy and I am proud of the way he looks and acts when I take him anywhere. People ask, what do you feed him? how did you get his hair so shiny? where did you learn how to train him? Feel free to put this on your web site if you want, I'd like everyone to read it, because my honest opinion is, no dog owner can go wrong with your books." Don't make an appointment to have your dog spayed or neutered until you read pages 318-324. You'll learn the 5 safety precautions that must be taken during surgery. Tragically, dogs have died because their owners didn't ask for these 5 safety precautions. The 3 most common mistakes dog owners make when choosing their vet and how to find the best vet in your area. You might think your vet is fine.... but can he pass the 4-question test in Chapter 11? My 11-Step Health Care Program is very clear and easy to read. Everything is laid out for you.... what to do..... what not to do. 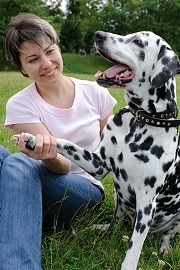 Following this program gives your dog the best chance of staying healthy and happy and being with you for a long time. That will make all of us happy! 11 Things You Must Do Right is the best book I've ever written.... and I've written 15 books, so that should tell you how highly I think of it! But my other books are good too, and I'd really like you to have them. Free! Bonus Book # 1.... Use this easy-to-follow, step-by-step guide to check your dog's health on a regular basis, so you can catch health problems when they're still minor and easy to correct. Tells you exactly what's normal and abnormal on every part of your dog's body. Bonus Book # 2.... It's hard to find honest information about health problems because breeders don't want to admit to problems in their favorite breed. But I've done the digging for you! 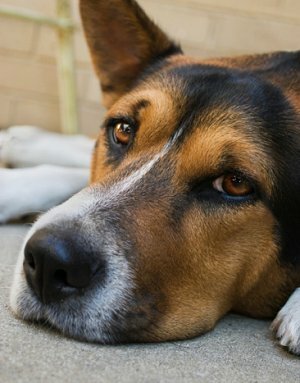 Now you'll know which health problems to be especially watchful for in your breed. Bonus Book # 3.... This is the book to turn to if your dog develops any health problem. You'll learn about symptoms, diagnosis, and the most effective treatments with the fewest side effects. You'll even learn when inexpensive at-home treatments are better options than going to the vet. Bonus Book # 4.... Follow my Respect Training Program and your dog will look right at you, listen to your words, and do what you say. I'll show you how to teach all the vocabulary words your dog needs to know, plus calmness, gentleness, acceptance of being handled, obedience training, and much more. For puppies and adult dogs of all ages. Bonus Book # 5.... Is your dog smarter than your best friend's dog? You'll never know until you test him! These 25 fun tests measure your dog's intelligence and problem-solving skills. Find out how smart your dog really is....or isn't! 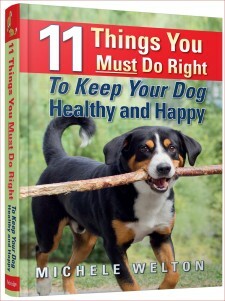 11 Things You Must Do Right To Keep Your Dog Healthy and Happy PLUS your 5 free bonus books cover all the bases of feeding and training and caring for your dog, which is why I want you to have them ALL.....for just $19. I charge so little for my books because I know they will make your dog's life better..... and that will make YOUR life better. I would much rather have many owners read my books for a lower price than have fewer owners read them for a higher price. My compensation would be the same either way, but at the lower price more owners and dogs benefit. I offer a 30-day money back guarantee. Plain and simple, if you're not satisfied with my book within 30 days, I'll refund your money (shipping is not refundable on CDs). I'm a respected author, and I want you to be happy! I'm absolutely confident that you will be. Dog owners have been buying my books online since 2002 and my refund rate is an infinitesimal 0.1%. That means 999 people out of a thousand are satisfied. I'm pretty happy about that! I wrote 11 Things You Must Do Right To Keep Your Dog Healthy and Happy to show you how to feed and care for your dog so he lives a long, healthy life and seldom needs to visit the vet. When you follow the health care program in this book, you will be doing everything you can for your dog to live a healthier, happier, longer life. That's why I offer my book (plus 5 free bonus books) for only $19.... because I know they will make your dog's life better. Which sure makes me feel better.... how about you? 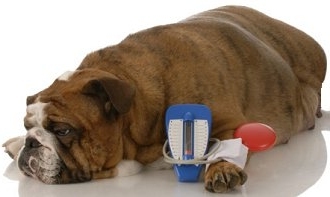 Follow the 11 Things You Must Do Right and your dog should live a long, healthy life and seldom need to visit the vet. Your dog is counting on you to do these 11 things! Invest $19 now and prevent health problems that could cost hundreds of dollars later. Avoid unnece$$ary trips to the vet. Avoid risky treatments and their side effects, too. Choose safer at-home treatments for many common health issues. I'll show you how to feed your dog for optimum health – we'll talk about the best dog food brands, homemade food, and raw food. Learn how to give your dog an at-home, nose-to-tail health checkup. Match your dog's exercise and mental stimulation to his needs. 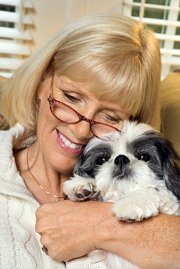 Learn how to remove canine stress so your dog is calmer and happier. Controlling fleas, ticks, and heartworm.... 11 fun activities that keep your dog's mind healthy.... how to keep his coat shiny and clean.... how to dog-proof your home and yard.... all about spaying and neutering.... and much more! An eye-opening book that will make a big difference in your dog's life. Start reading immediately on your computer, tablet, or smartphone. The CD contains PDF ebooks that you read on your computer screen with Adobe Reader. Works in any computer with a CD drive. Your CD will ship within 24 hours, by First Class Mail (low cost) or Priority Mail (fast delivery). International orders ship by First Class International.